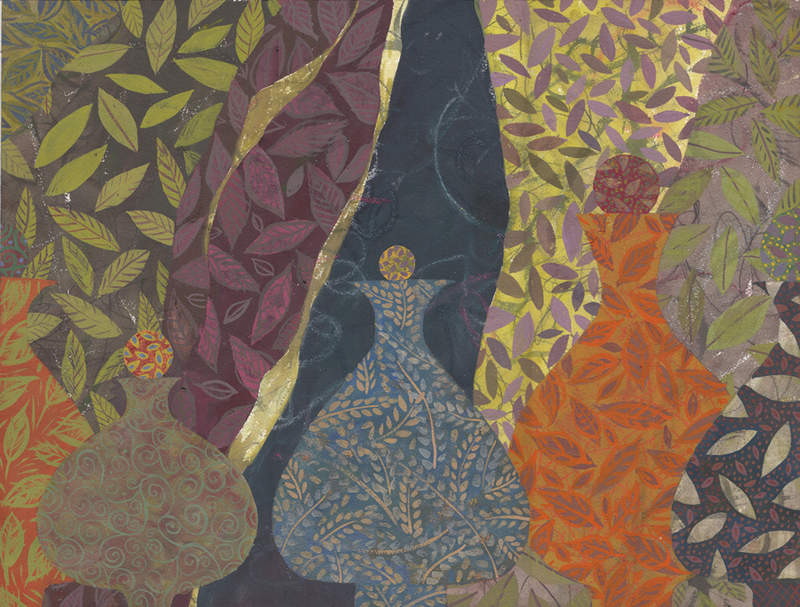 Five Persian Flasks, 2014, Gouache on paper 46 x 61 cm. Contrasting wild, spontaneous and drawn undercoats, with the ornamental, painted over layers, continues to intrigue me. I find it cathartic to bounce between wild dance movements, usually created while standing up, and the very controlled leaves painted while sitting. In this series, I search for a paradox: Either by unexpected colors or by subject matter and line, I seek to create, erase and recreate a feeling of depth and distance. These round bottles, supposedly with volume, can only be flat. Cutout. Motionless. The patterns behind them however, flapping in the wind, are anything but that.